We have the superb Marek Rodak but who has had the CA boost he deserves, he'll be your #1 for the season with Price as your back up. You shouldn't need to do anything here. You have two capable goalkeepers. Center backs - This is covered. Ajayi is your best, I expected Robertson to partner but it looks like it'll be Raggett and/or Wood. Vyner and Vaulks can cover here, with Zyner being your back up right back and Vaulks being more of a CM. Right backs - The vastly experienced Billy Jones will be starting, I was very happy when we signed him. Vyner will be cover. Left back - notice no s? Because we only have Mattock. We can look at bringing somebody in due to Purrington being our on loan or have one of the CBs taught to play there. Thing is, none of them have the pace to do it. I think we'll need another to cover for this season. Center - This is a very strong area. Towell is the best of the lot and will be starting. If we use a two man midfield, Vaulks, Manning and Palmer will all be fighting for it. They're all good enough. Potter is good enough but is sadly injured for 3 - 5 months. Wings - Newell is your LM, Taylor is your RM. Forde and Williams play back up both of these. Not the strongest areas. I may look at a flat 4 - 4 - 2 due to this. the season from only three players. I need two players in for free. 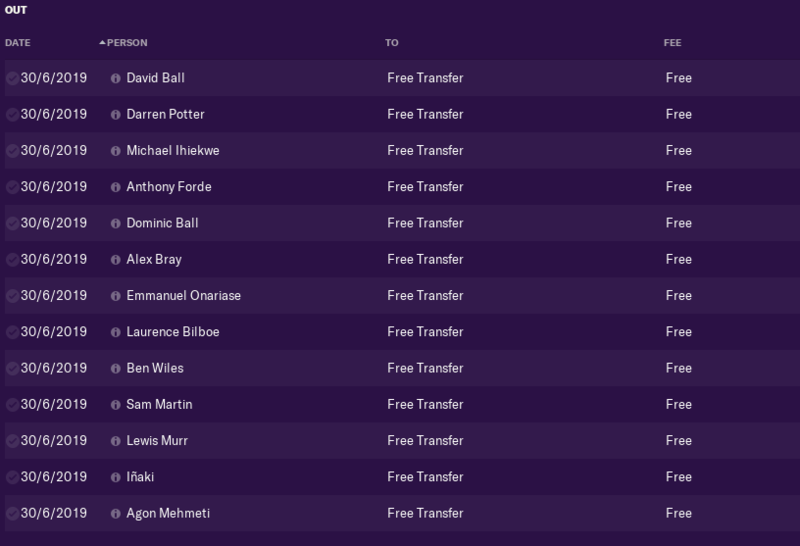 I already have 5 players in on loan and I need them all, especially since they are here until the end of the season. Good luck with the Millers! 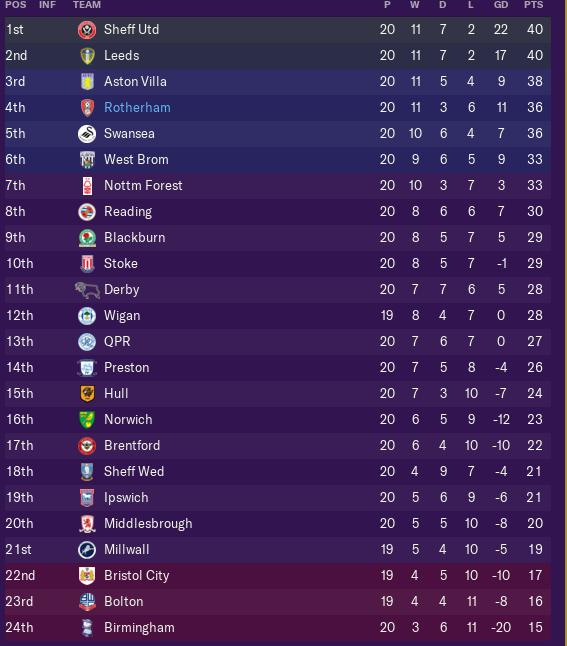 I think like in real life, you need a goal scorer, we create plenty of chances but don't have a 10 goal striker a season, never mind a 20 goal striker. Bust your wage budget on a player that can finish and I think you will stay up. Will be following this one!!! We had more chances then Spartak but we couldn't finish them, I changed tactic and we've won every game. Williams was absolutely brilliant vs Parkgate and seems to score from that LM spot, Newell creates more from there. Problem is we now face Brentford. Smith is half cropped and Proctor is out, so I have one fit striker in Vassell. Proctor has been great so it's a huge shame. I've not been able to bring anyone in. I refused to give Kevin Constant a two year deal so he went else where. I've found a LB but doesn't see Rotherham as a good move so I have on my short-list, maybe he'll give in over time. Who knows? We have a week to bring two people in and at this current moment we'll be bringing in no one. Are the 2 wide men more suited if pushed further up as attacking wingers? Any young Prem lads available to cover from the front 2? 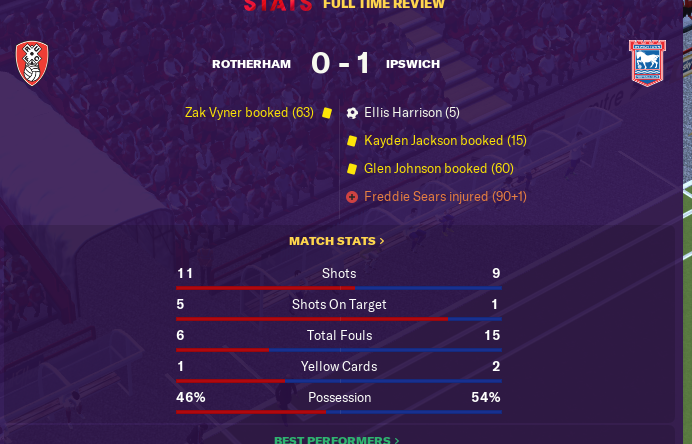 Can we do better than we did in real life in the opening game? Yeah, we lost 5 - 1 so here's my attempt. 6th minute: MacLeod hits a freekick from 25 yards, it's just wide. 11th minute: Maupay shoots! But he's offside. Phew. That was close. 28th minute: Mattock is injured, Jones takes his place. 38th minute: What a goal for Brentford. Ball comes in, we clear and Macleod volleys it in. That was quality. We're into the break and we've not even had a shot. We need to change this up. They've had 9 shots, 1 on target. 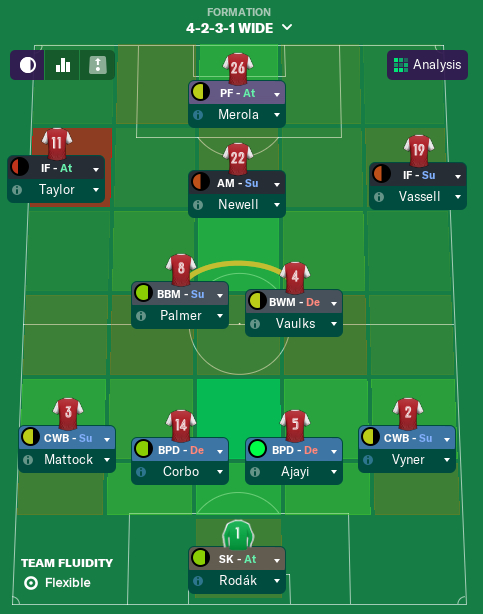 Think I need a 5 man midfield since Smith isn't exactly fit. Going 4 - 3 - 3. Palmer and Taylor replace Forde and Smith for the 2nd half. Vassell uptop on his own. 46th minute: Manning hits it over from a freekick, our first shot. 47th minute: Brentford score but it's disallowed due to a foul in the area. 59th minute: Williams goes close, his header at the back posted is saved. 61st minute: Williams solo effort goes wide. Atleast more encouraging signs. 63rd minute: Williams' shot is saved easily. Can we get one of them in? 75th minute and we're still behind so I'm going very attacking. 77th minute: Williams gets in but hits his shot wide. 80th minute: It's 2 - 0 to Brentford. Macleod gets his 2nd. 86th minute: It's 3 - 0. Maupay hits in a low cross. Maybe attacking was a bad idea. We gotta play better then that. Ah awesome, I will be following. I feel like they'd get in behind. What I can see, no. There's a limit to 5 loan players in the starting 11 so it'd make it tight but they want wages covered. E.G Ashley Fletcher they want 10k P/W covered, we cannot afford that. 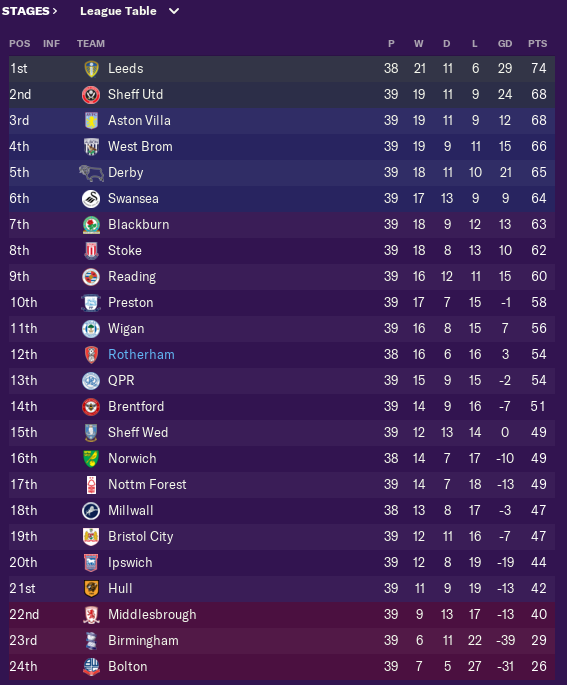 What did you choose for the season aim "Avoid Relegation" or "attempt to avoid"? I bottled it and went for attempt to avoid despite the extra cash, which would have been nice. 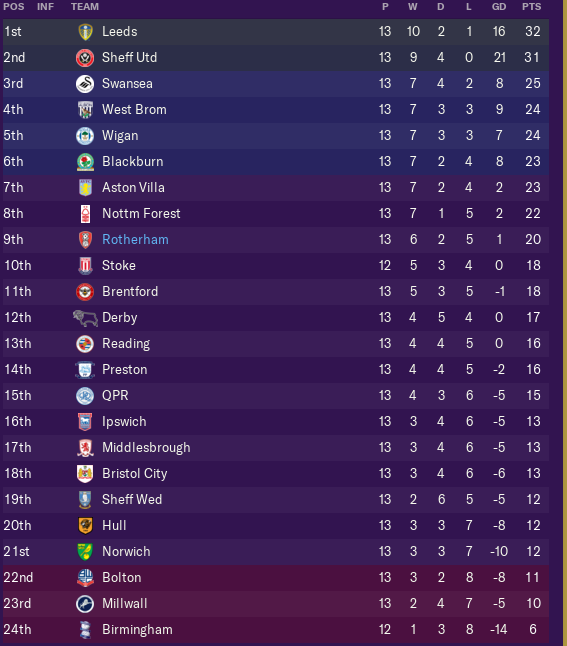 Not the best of starts, but Brentford are a real darkhorse for promotion. It'll be about making the NYS a fortress this season. Avoid. Though the extra cash would of been nice. I'm having to bring in two very back up players to compete when we have much better out of the club on loan. Purrington, David and Dom would fix my problems to no end. Yeah, they're a class team. Let's see how we do in our home game. So many Millers on the forum! Best of luck once more SpillBlood! Last Nomadic striker I had scored goals for me. Dumitru he was called iirc. May be a step up for him but best I can get. The LB I wanted went to Norwich for 10k p/w. I can't match that. 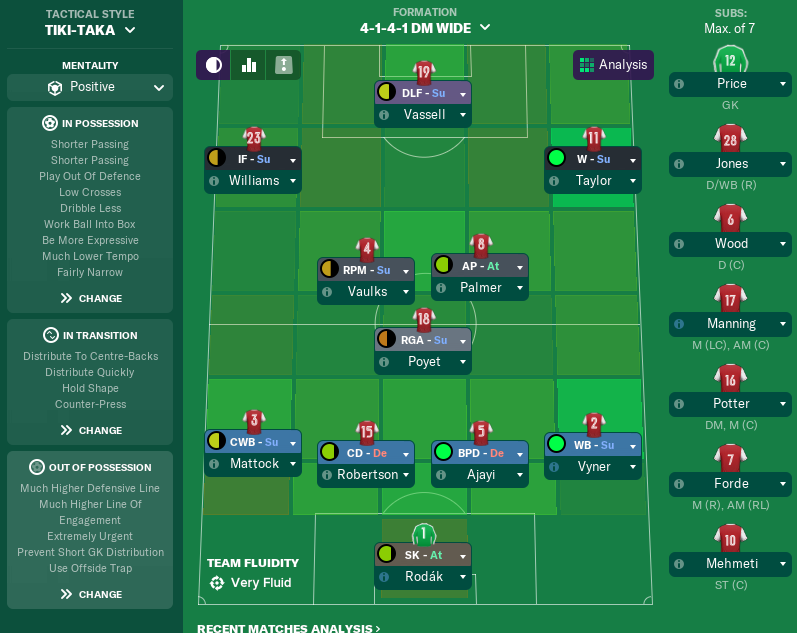 Oddly enough the squad think I need more depth in midfield. I'm not sure how or why. This is going to be a long season.... Smith missed such a sitter. 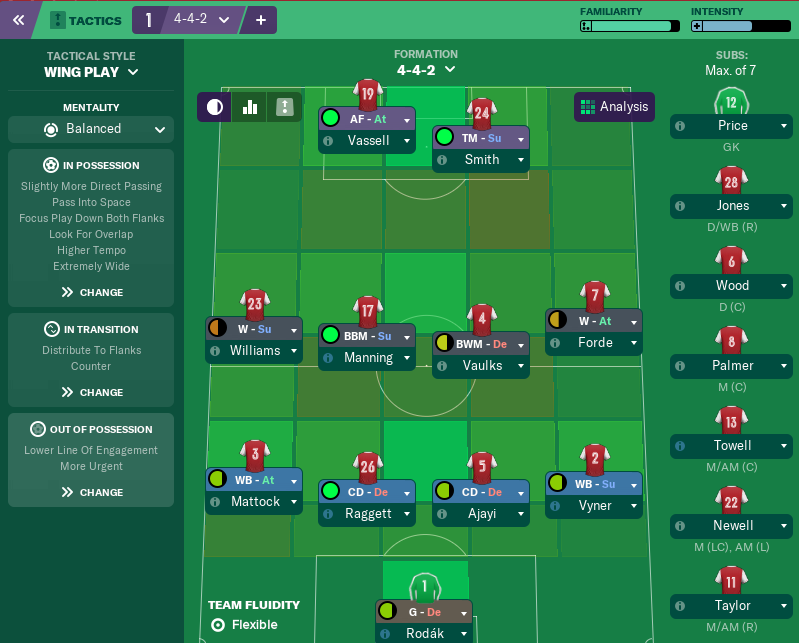 I've changed formation and we've finally got a win! We hit the woodwork 3 times as well! we couldn't get the ball in the net! But we do have some good midfielders! 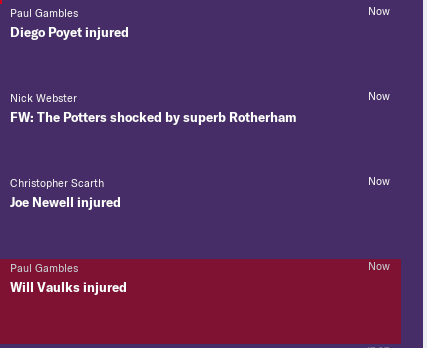 First, I've been majorly unlucky with injuries. I've just had three in one game, meaning Forde ended up in the center for me! September went well. Good wins vs Derby and Stoke. Villa, we scored first but then they were just class. Bolasie, Adomah and Kodjiia are just a class above. 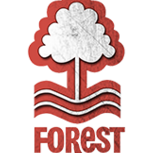 Forest I went back to an old tactic due to injuries, they scored, we scored and then they battered us. Even changing my tactic back to norm, we couldn't get a foot hold in. Frustrating to see so many injuries, but September is a perfect month in terms of making the NYS like I said. We had to change formation due to injuries, it's scrappy but we're winning games. Taylor has handed in a transer request. I mean he's only started 3 and come on as a sub 5 times but we're playing well without him. He thinks we're a worse team when he's not playing but the stats prove otherwise. He's created 4 assists out of 8 games which is nice, don't get me wrong but one player doesn't make a team. He's also had his own injuries to reduce his playing time. Poyet has been great at DM, Ajayi covered him when he was injured and played really well. I'm impressed so far. 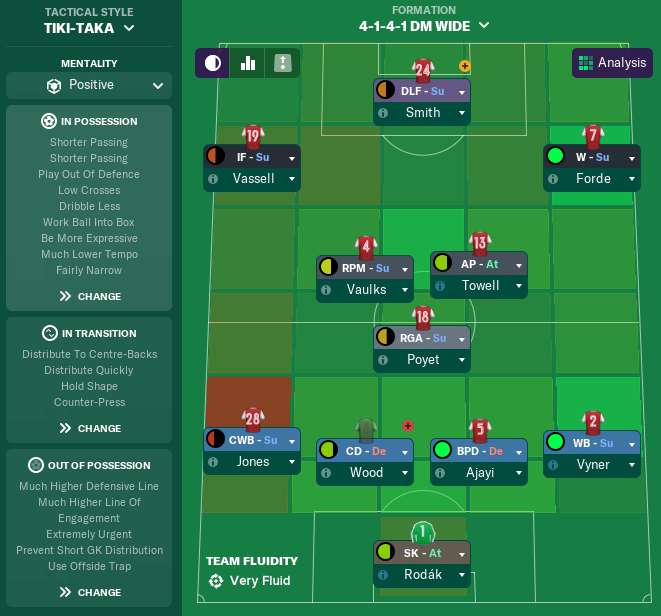 Both Bristol City and Birmingham games we changed to the Tiki-Taka formations to win and see out the games, so Taylor and Williams are playing, guess we just can't please everyone. With Newell and Williams both currently out, the 3 uptop suits us since all 4 strikers are fit. Forde and Taylor will have to play as CMs/DLF in this formation. We still have Vaulks, Jones, Newell and Williams out. Potter and Palmer are not fit to play yet so people need to play where we can put them and what works. I mean how nice does this look? Both the signings I made are working out. Inaki covers where we need him, he's played at both LB and RB and Mehemeti has 6 in 11 with 2 assists and 2 MotM awards. Hopefully I can play a couple of games after work tonight. Ipswich have won a few matches already? So unrealistic! So we had our players fit again to play Tika-Taka and that we played. Look at these results! I can't get Smith to work uptop. I'm retraining both Proctor and Smith at LW due to some games I've swithed up to a TM - S instead of IF - S whilst Williams was out. Potter came back from injury and is playing just as well as Poyet, was great to see. 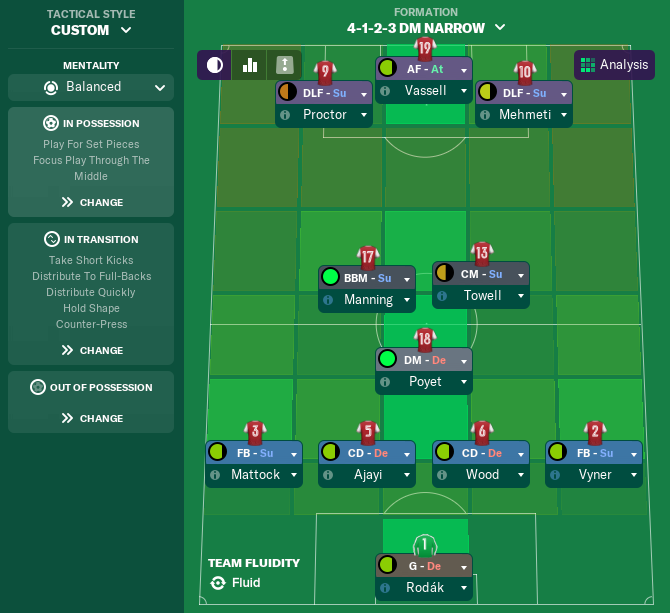 I needed to rest the main team for a game which was vs QPR. Jones, Wood and Inaki were brilliant. Everyone is performing apart from the DLF-S spot. I tried Vassell there against Norwich and he scored 2, so he's starting there for a bit. Smith is moaning about first team football but he doesn't perform, at all. Taylor made me eat my words. He's happy playing, new contract signed and has made the AMR spot his own. He assists, he scores. He's been sensational since returning to the starting 11. Robertson and Ajayi have a brilliant partnership at the back and when @Jamesbfc1887 asked me about the team I said they'd be my starting back two and it's ended up that way. Manning and Palmer may both have gotten goal of the month vs Norwich, we'll have to wait and see on that one. Team is brilliant and I can't see me changing much in January at all. Mattock was on about moving to a "bigger club". I've managed to persuade him otherwise, he's actually been amazing for me which I never expected. I think I need to tie Ajayi down now. West Brom and Middlesbrough are both interested. I do need the money, the accounts are poor but he's my best CB and could be here for years to come. Oh and I found a youth player, retraining him LM. He may become better than any of my wingers, he may flop. We'll see. The next update will be tomorrow some time, not sure what time. Working evening shifts today and tomorrow. I'll fit games in when I can. I'll fix this mess of a code when I get home. My brexit as well. A nice one afaik. Wow, absolutely fantastic month and lots of back-to-back clean sheets, which will certainly increase morale and confidence too. We beat Wednesdays to get things off to a good start but Vassell got injured and it's hurt us a lot. West Brom game we should of had at least a point. Ball was going off and Williams has kept it on for some reason, lost it, they've countered and scored. Bolton was even worse. I had to put on a 2nd squad due to fitness. Omayer who did score on his debut missed two great chances, Towell missed a penalty in the 90th minute, Taylor then missed a sitter and how did Bolton score? Rodak dropped the ball to their striker and Forde missed a simple header for them to score the only shots they had on target. So frustrating. Table looks a bit different now. Biggest problem is how poor my Strikers are playing. Proctor and Smith both missed sitters in these games to get us a point and I'm not sure how to fix it. On the plus side Mattock and Ajayi have both signed new contracts. I wouldn't be surprised to see some £££ for Ajayi come the summer, he's brilliant. Another loss, that's 4 in a row. Time for work now but can we turn it around in January? Will we bring anybody in? Will anybody leave? We'll see! You're still doing fantastically well despite these little set backs. Hopefully you'll be on the right path again soon and getting some wins on the board. 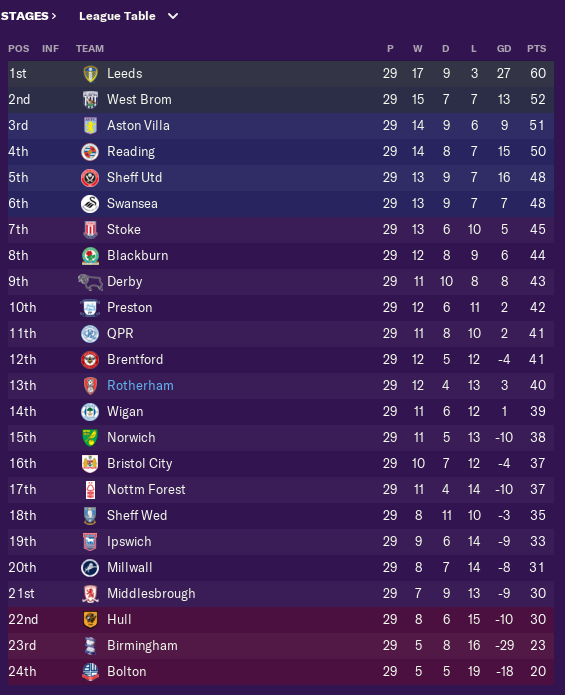 To think survival was mostly the aim at the start of the season; this is a huge overachievement. It's getting colder in here, can somebody bring us a cup of tea? Even though we're doing quite bad, I changed my expectations to this for the extra money. It's frustrating though, we're losing through our own mistakes. Ipswich we basically passed them the ball for their goals, especially the 2nd. We'll have more chances, we just cannot finish. Leeds game, Robertson hit the crossbar from a headed effort via a corner. Everyone just stud still whilst Leeds countered and scored, it was crazy. Who knows where our next win is? Williams scored a wordly but we were battered, proud enough of the lads. Raggatt wanted to go back as he wasn't being played, tbf he didn't suit. I've brought in 2 Italians players in on loan. They look alright, might be able to fit in the team as well. Onwards to Feb, will we win a game? The formation is changing though, that I need to do. Oh and new work permit rules. The curse of the FM coding!!!!! I swear that my laptop knows when things are going well and then nosh - kick in the spuds!!!! Hopefully you will do enough to stop the rot and drop. Millwall was the surprise. 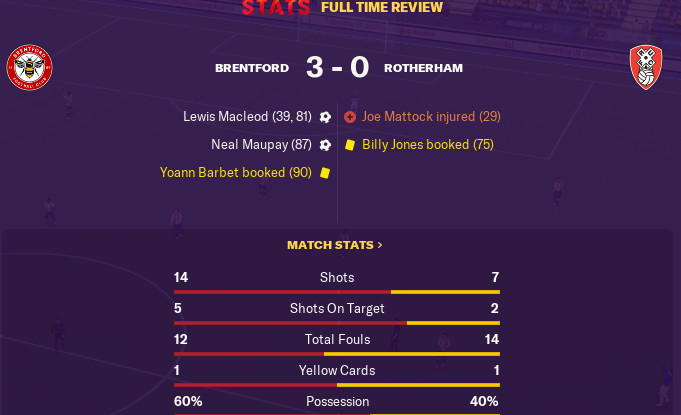 We went with a new tactic and my word Millwall had chances, I didn't blame the guys, we had to try somehting new, but we put the chances away, they didn't. It was the start of something good. Merola got himself an assist as I started both Merola and Corbo. Wigan, he was the star scoring both goals, he should of had his hat-trick but it was nice to see. Corbo even got an assist. Hull was a different story, they were the better side, nothing I could do, say, changed that. Sheffield Wednesday, a game I couldn't lose. We went behind twice and as it was looking like it'd be a draw, Smith missed a sitter. I thought it was all over, Mattock pinged a ball through and Newell slotted in, we won, it felt amazing. Reading was an even game, I felt like we could of edged it, Smith just doesn't score, Merola came on and got a goal instead. This is how we're currently lined up and it's working. Could we sneak in the play-offs? A few good results and maybe. That's the way to recover! Safety is now guaranteed now you've hit that 50 point mark. Looking at the results you're probably wondering why. 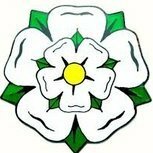 Well, Blackburn aside, they hammered us, they were brilliant, especially Dack. Sheffield United, we were 3 - 1 up, I made 3 subs and it went so horribly wrong. Fair enough Newell didn't give away the penalty but their 2nd and 3rd goal came from Newell losing the ball, was so frustrating. QPR, they went in 2 up due to silly mistakes but went down to 10 men just before the break. We battered them, 10 shots on goal, they had 3, we had a number of CCCs, they walked away with 3 points. The Derby game was the opposite. It looked like it'd end 2 - 2, 95th minute... they did this. Karius is that you? Was nice to end the month with a win. Proctor has been a surprise package all of a sudden. I never like to do these things; Mehmeti wasn't being played any more and his contract wasn't being extended. I have players ahead in the pecking order, but he had interest from America and he's out for 3 - 5 months with a hip injury, feel sorry for him. Oh yeah, we've got out youth players through. Two of them are tied down, don't look awful. Who knows if one will play in the first team one day. Absolutely! 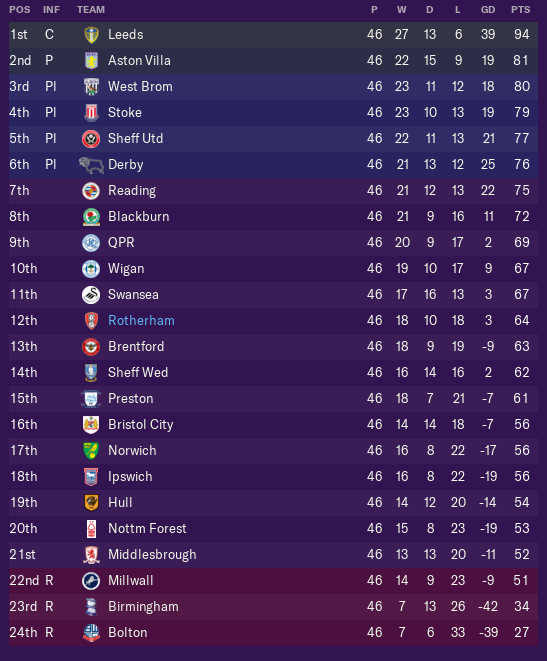 Glad that I've been able to keep my head above the water and not be in a relegation battle. 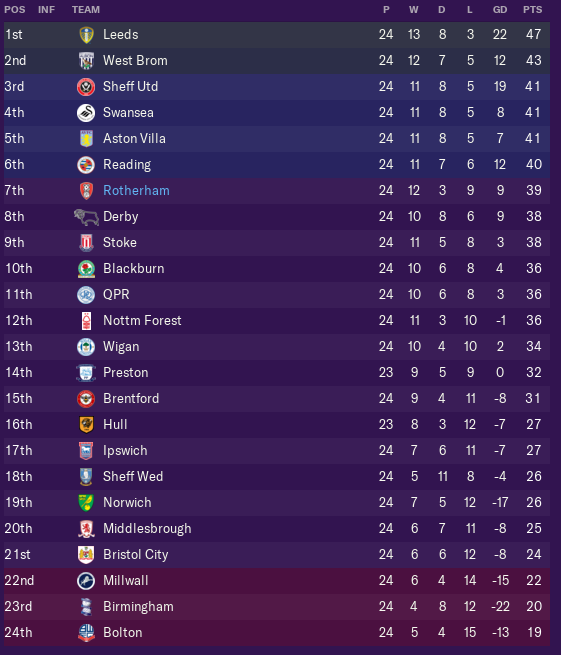 Bolton and Birmingham are going down but Middlesbrough could be! Just to point out, 'Boro face us and we're at home . Those draws. So many close games. Newell came on to be the saviour against Villa, Stoke we were 2 - 0 and then we were lucky to draw. 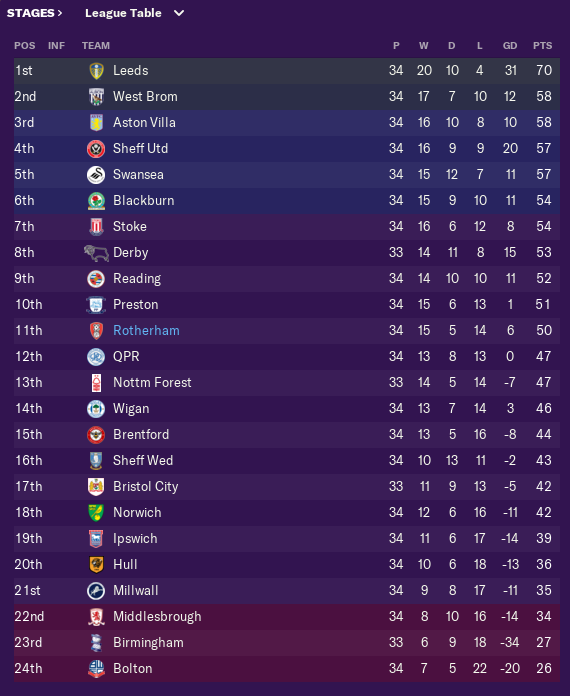 It's been an interesting season, one where I'm proud of the lads, we finished 12th, 13 points above relegation, that is some damn effort and Newell picked up this. Oh yeah, Mattock played pretty well also. Yep, he's played that well, I know I have a LB for next season. I think the goal for next season is to cement a formation and build a team round it. It all depends on my finances and no doubt I'll make posts about that. 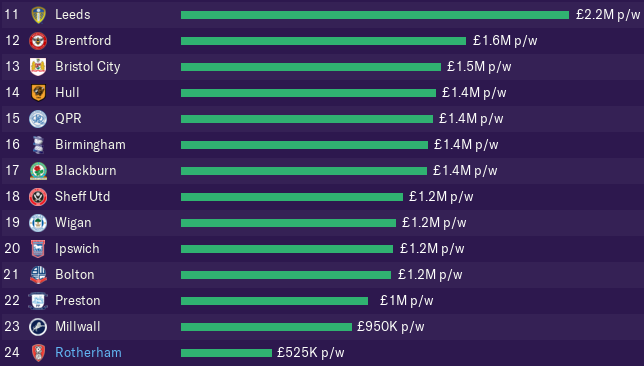 I'm looking at bringing in younger players rather than experienced, I need re-sale value here. Not sure how Smith is there instead of Mehmeti or Vassell? Odd choice. 13th of May this is the bank. If Tony doesn't invest any more. We'll need to sell any players who are wanted. This is currently Ajayi, Poyet and Newell. On the plus, we're getting Rodak for by the looks of things for a year for 3k p/w, that's great news. Shocked to see two loan players that didn't play that many games sell so many shirts. Oh, he put some money in! If I can get money for players, I will. 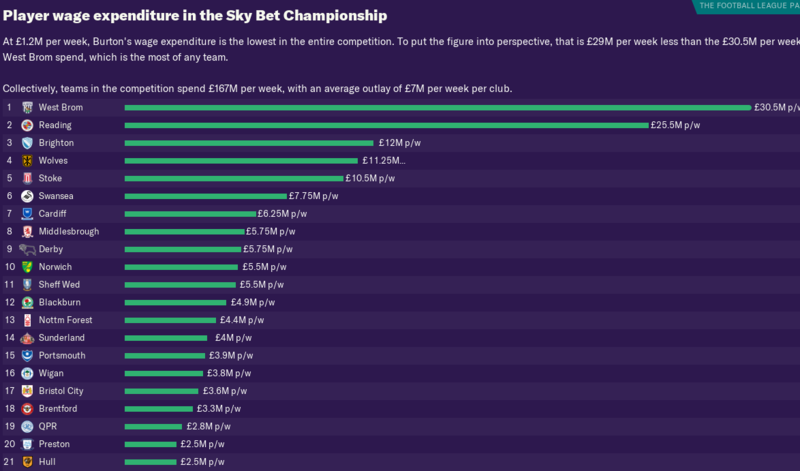 A little bit more wage then last season but we're lacking any budget. This will be a challenge. This may help, hoping we get a big club for this. Bit more then I'm used too. They won the play-offs. Wilder has gone to Villa who were also promoted as Dean went to Palace. Seems... silly? We won the playoffs? That’s a bug that needs reporting! Great going Spilly I'm always tempted to have a go with the Millers after reading your stories. 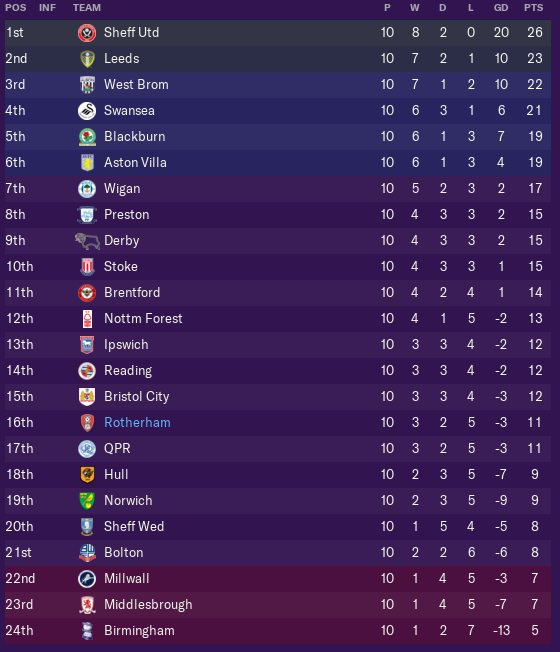 What was your youth intake like mate? You got a million pound striker hid away? Cheers ^_^. It's a difficult challenge this year. Above I posted a LB and a RB which were by far the best that came through. Might be able to play some games for me in the future. When it comes to strikers, wait until I post who I got in on loan . Yeah saw those two......if you dare say you have brought.....I can't say his name back! No former players. Though I always keep tabs on Dicko, always. Never managed to bring him back to Rotherham. I'll make an update soon but I can't not share this, it's a incredible signing, as long as he scored like he did in the Netherlands and not anywhere else ^_^. Expecting nothing more than a dozen overhead kicks from this lad then.............Cracking signing! He's going to be a beast if he can stay fit. Uhh, I think Reading might be drunk. He's my vice captain, worth 2.9mil, got another 3 years on his contract and has a great partnership in the middle with Palmer. They'll need to try £5mil for me to even blink an eye. First, let's see the wage difference this year. That's a bit of a difference between West Brom and Rotherham! Trying to see is Reading have had a take over, how in the world can they afford that! The only one who could of done a job was Dom Ball but he wanted too much wage. He'd of been backup DM/CM/RB and 9k p/w isn't going to work for me. Shame I had to let Forde go, I'm a fan but 23 games, 1 assist and an avg of 6.57 he isn't a player I want at a club going forward. Sadly we've encountered a bug where we couldn't bring in Jordan Spence at RB, so I've brought in Mitch Clark to cover and push for Jones' starting spot. He'll be covering LB/CB if need be. Erik Palmer-Brown will be starting next to Ajayi, with Robertson and Wood back ups. Speaking of Ajayi, I've brought in a fellow countryman in loan to play the AMC role, which we needed. Manning and Towell didn't perform there last season. We've got a goalkeeper to breath down Rodaks neck. Quite happy with this, think it's a good capture. This is my favourite. Millar the Miller. Hopefully first team football will push him on. He can play uptop or IF which is great for me. Pilkington can play LW/AM who he's here to cover. Taylor is out for 3 - 5 months so Whalley was brought in for back up. Whiteman is a young goalkeeper I've let go play first team football on loan. De Bock is good LB and can cover CB. Mattock is out injured for 3 months so we needed someone. Charsley is back up, hopefully playing team will help him improve. I do think I have a stronger squad but it's about getting those strikers perform in Janssen, Vassell and Millar in a formation that suits. Hopefully the players will cheer up now, they don't think I have enough depth and at the time, I didn't but surely I have enough now? We played well pre-season, we should of won vs Werder Bremen, just missed a couple of good chances but that's encouraging. We got our revenge on Boro in the opening game. Taylor scored and got injured and our only option was to go 3 uptop. Janssen should of had his hat-trick, missed so many chances but Vassell got us the goal. Jones and Purrington played amazing. The aim is to finish in a good spot again, keep building the team and hopefully get more money in the bank. We're a small club and it's going to take time to break the mould. I have started the new season but I'm not sure what to do. If somehow with the editor I can fix the Spence bug, i'll continue. If not, I think i'm going to restart come release day.